You are here: Home / Announcement / The Amp Hour Now Has An…App? 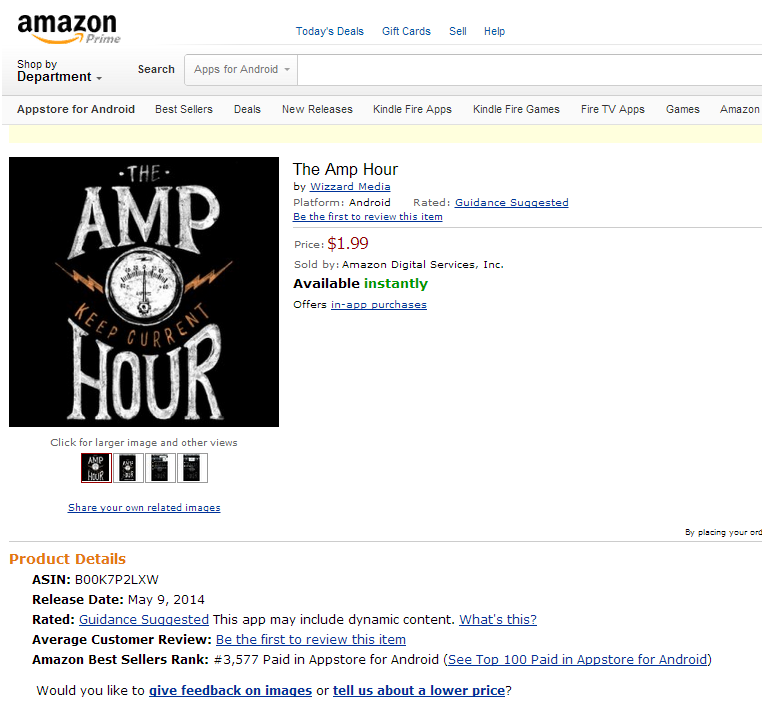 The Amp Hour Now Has An…App? Yup, that’s right. And it was Dave’s idea! We have been using LibSyn for a while now and really really love the service they give us. They are our CDN, which means the shows are downloadable reliably and with relatively high speed almost immediately after they get posted. They also offer a service that hosts an app on Android without any cost to us…so we thought we’d try it! The app does have cost associated with it ($1.99), some of which goes back to LibSyn and some of which comes to us (we’re not expecting much). The best use case that we’ve found so far is that it is easy access to our entire catalog of downloads. In the past, people have lamented that we only hold 25 shows on the RSS feed…this has them all. So if you’re looking for an easy way to listen to all 197 episodes and quickly be notified of other episodes, consider downloading the app. In the future we can push custom content to only those who have the app installed, but this isn’t something we’re planning on doing immediately. (we also got a $1 credit for Amazon music when we purchased–likely because it was our first purchase–so that could help “offset” the cost). Just fyi , there is a option in wordpress on the site side under settings (reading > syndication) to make the rss feed any number you set it to 999 , you done for the next 10 years of shows….. Yes, we tried that once. The real issue is actually the 512K memory limit on most RSS feeds. This would be Better if it was A free app.